I assume this is the bird I saw over Thurso ~ midday. 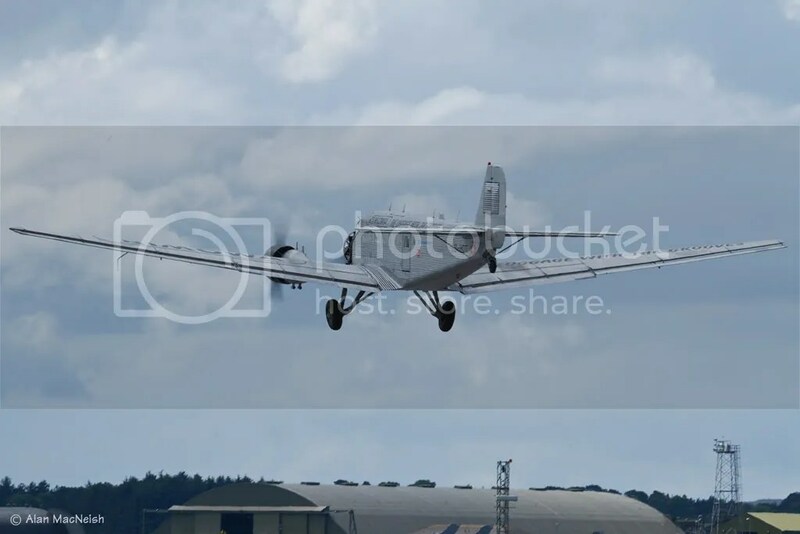 The Junker-52 which spent the night at Wick airport. As one development at one windfarm in Caithness continues apace, permission for another is refused. 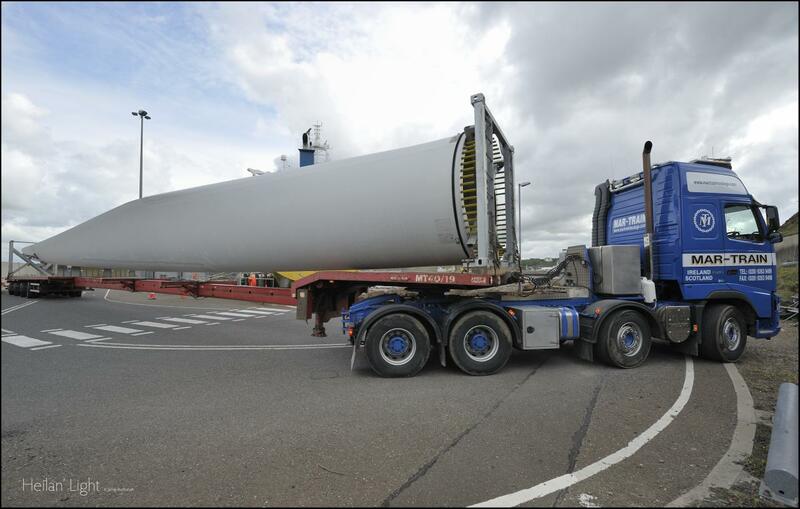 Earlier this month, the first of the giant turbine blades bound for the Baillie/Statkraft site at Shebster were offloaded at Scrabster Harbour (captured above by Jamie Buchanan of Northern Light). On the other hand, last week permission for 27-30 units at the Spittal site was rejected by direct Scottish Government intervention (see here for the letter of explanation). A principle reason was the detrimental effect that it would have on the appearance of the landscape. Views for or against windfarms can be, in a word, weird with us agnostics left scratching our heads. Those against might imagine blades shearing off and taking-out nearby houses; or performing a genocide of local birds (apart from pheasants, for which “bird brain” should have been coined as they select the last possible moment to run out in front of cars before expiring in a cloud of feathers, I cannot see this happening); or the landscape looking like something from a John Christopher novel. Those for might accuse opponents of nimbyism and wanting to keep their holiday homes unaffected by the necessities of an industrial society. It is worth pointing out, however, that we have been here before. When the National Grid was being expanded in the mid 20th Century, similar complaints were made about the spoiling effect of unsightly transmission towers appearing across isolated Scottish glens. In response, just as “wind-turbine” conjures up images of brutal machinery whilst “windmill” suggests pastoral scenes in the Fenlands or Low Countries, the term “pylon” was hit upon to hark back to the monumental gateway in Ancient Egyptian temples or Christian cathedrals. Likewise, the formerly utilitarian massive poles with electrified wires hanging off them were redesigned to take on a more curved and softer appearance, and given a more friendly name. Sadly, one of the effects of the rapid expansion of Scrabster harbour within the current confines (as opposed to, say, extension along Scrabster beach) has been something of a sidelining of smaller boats. 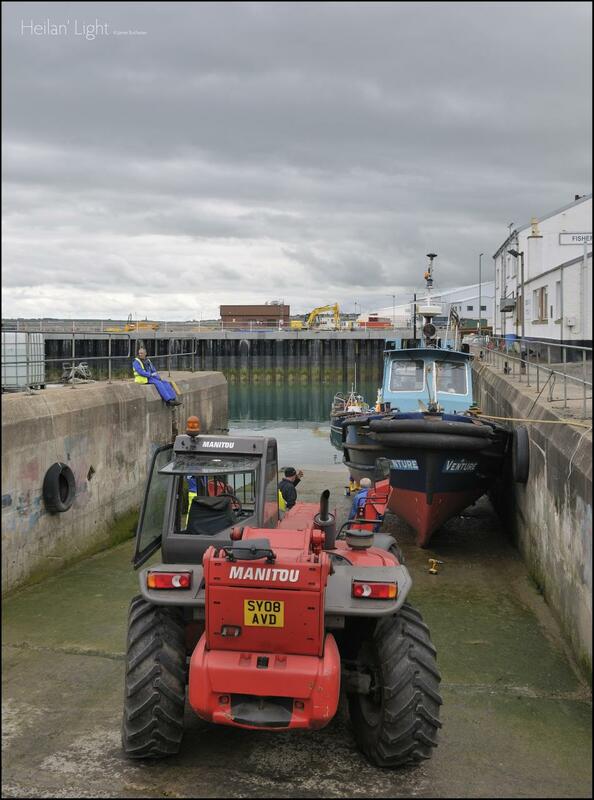 Complaints from leisure boat owners were purportedly met with the suggestion they relocate to Wick marina, whilst single fishing boat operators have found it more difficult to find a mooring and witnessed more damage to their crafts. The slipway shown above in a snap by Jamie Buchanan is green, but beforehand would have been thick with growth: for good or bad, the increased currents with the opening-up of the harbour mean it and other parts of the harbour are less green. All the same, it is good news that with the modernization of the Seafood Park, JPL Shellfish is looking forward to accessing new markets. A lot of simmering anger in the normally sedate Photography forum of local webforum Caithness.org. Locally-based woman Jennifer Rossa operates operated as Caithness Crafts (not to be mistaken to the Caithness Craft Collective blog) selling prints and mock-up oil paintings of staggeringly beautifully rendered local scenes. Until, that is, one local photographer was passing through Wick and saw a photograph of his on sale in a shop window. This came as a surprise to him as he had not submitted the photograph, and on checking with the increasingly mortified proprietor discovered that said Jennifer Rossa had done so after signing documents which explicitly stated the work was her own. Very soon other local highly skilled amateur photographers started posting as they saw their work being touted on her website as her own. Shortly afterwards, this website and other photo-dumps were taken down and she made a perfunctory offering to sign anything to put a fork in the developing storm. As another forum member pointed out, such a commitment to legal documents would mark a departure from her previous flouting of the legal document signed at the [utterly blameless] Wick shop; which will not be the only outlet to have unknowlingly sold plagerized products. Since then, Caithness Crafts products have been flying off the shelves… as proprietors removed them to the back-shops. I have a fond memory of being at the top of Elm Row in Edinburgh when I saw a little squirt throw some item a bus. The driver did not flinch (it was soft and did not damage the window) and simply drove on. Little squirt chortled with his friends. Less than a minute later a Police car tears around the corner (we were almost on top of Gayfield Police Station), and out leaps a female officer who grabs little squirt without paying any attention to his friends. Clearly there was CCTV on the bus, and a direct link to the Po-Po. Either little squirt was splashed by cars driving through puddles, or he made at a little squirt himself. In contrast, Stagecoach buses in Caithness do not appear to have such equippment as local Police still are seeking the Wick High School pupils who smashed the windows of a moving bus last week. Over recent years, cetacean sightings around the Caithness coat has been markedly low. Not so this summer. 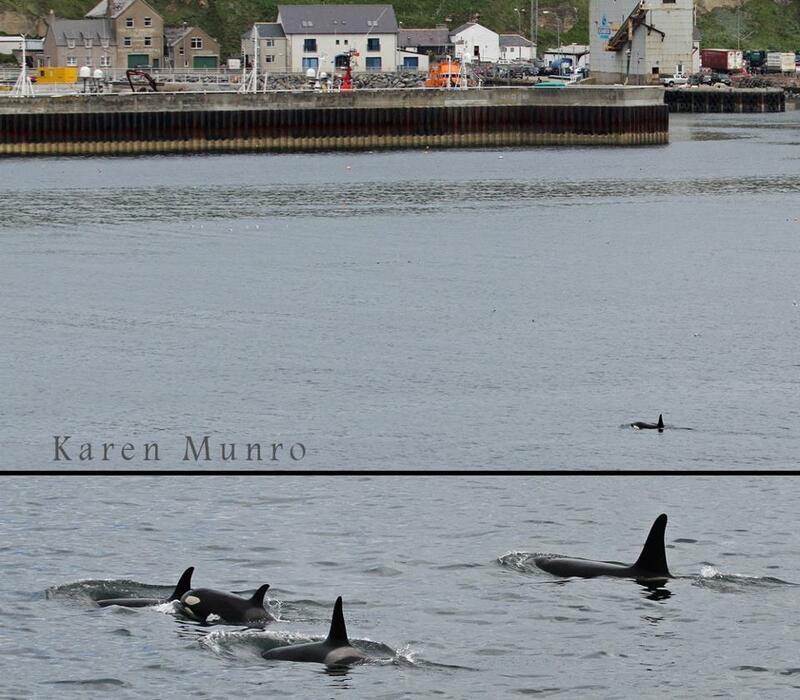 Less than a week after she photographed a pod of killer whales in Thurso Bay, Karen Munro of Caithness Sea Watching caught another scene. This time the pod came almost directly into Scrabster harbour, in full view of tourists and locals. The water was said to be boiling with the whales and sea-birds and, presumably, a shoal of fish being driven by the whales. After the latest incarnation of the All Star Factory went into liquidation in 2009 despite local authority and community funding, the site in Ormlie was boarded-up. A sale at auction in 2011 did not come to much as it was realized that desired planning permission for luxury flats would not be easily forthcoming, and the site has lain in ugly disuse since now. Promising news has come with the announcement that Highland and Islands Enterprises is considering partnership with a newly created limited company called Thurso Cinema (found also on Facebook). A public meeting is being held at the Pentland Hotel on Friday ay 1900hrs. Looks interesting. Certainly a more peaceful scene than one Karen Munro of Caithness Sea Watching previously snapped. 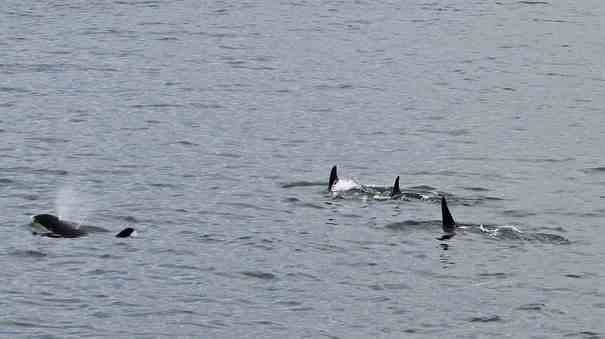 A pod of killer whales can be seen sauntering past Scrabster harbour. You are currently browsing the A Rabbit's Eye View of the Hyperborean North blog archives for June, 2012.